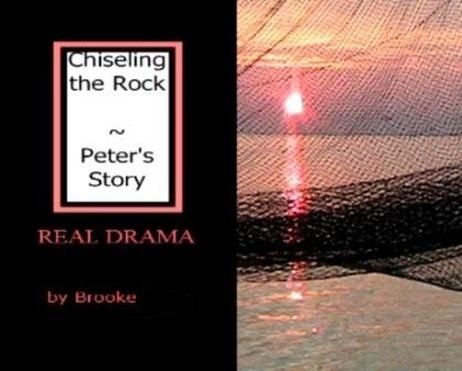 Characters of Chiseling the Rock - Brooke Brookreson-Williams. SIMON PETER – Prince of the Disciples; faithful husband. Bombastic. Competitive. Dynamic. Passionate. Patriotic. Prone to extremes. Choleric temperament. ANDREW – Peter’s brother; fishing partner; disciple. Curious. Dutiful. Hyper. Informal. Jovial. Sometimes clueless. Sanguine Temperament. JESUS – Mentally, physically and verbally matches Peter blow-by-blow. Masculine. Disregard all stereotypical images: Super-long, straight hair; sad eyes; slow movements; soft voice; snow-white robes. United, Perfect Temperament. MARY – Jesus’ mother; follower. Supporter. THOMAS – Disciple; scouts out a Samaritan village.